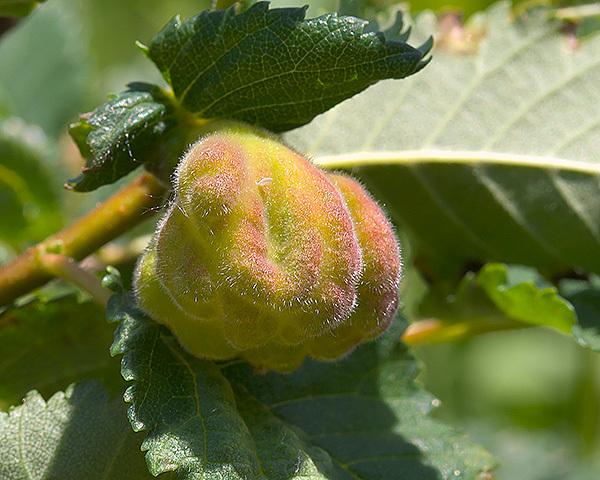 In spring the Eriosoma lanuginosum fundatrix and her offspring develop in large, closed, bloated-leaf galls (see first picture below) on various elm (Ulmus) species. This gall is produced by extreme enlargement of the cells of the leaf parenchyma on one side of the mid-rib near its base. The gall tissue is light green at first and covered with fine white hairs, becoming brown as the gall matures. 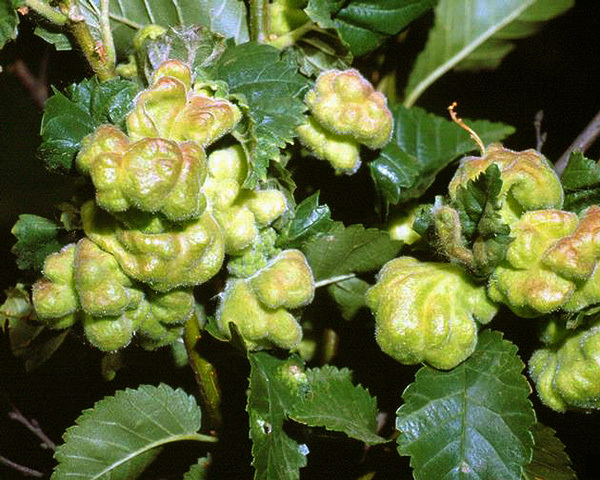 There are often clusters of galls near the ends of branches (see second picture below). The fundatrix of Eriosoma lanuginosum which initiates the gall is blackish and wax powdered (not pictured), but the offspring of that fundatrix (known as fundatrigeniae) are wax-powdered, wingless and yellowish when immature. Alates produced in the second and third generations of Eriosoma lanuginosum on elm are dark green to black and wax powdered. The body length of the adult Eriosoma lanuginosum alate is 2.1-3.1 mm. Apterae on the secondary hosts are pale yellow to reddish, with an adult body length of 2.0-2.7 mm. The alates leave the galls on elm in late June-July and migrate to found colonies on fibrous rootlets of pear (Pyrus communis) or quince (Cydonia). The return migration to elm bark occurs in September. Eriosoma lanuginosum occurs throughout Europe, the Mediterranean area, and Asia east to Pakistan. Blackman & Eastop list about 75 species of aphids as feeding on elms worldwide, and provides formal identification keys for aphids on Ulmus. Of the 22 species that feed on English elm (Ulmus procera) worldwide, Baker (2015) lists 14 as occurring in Britain: Colopha compressa, Eriosoma anncharlotteae, Eriosoma flavum, Eriosoma grossulariae, Eriosoma lanuginosum, Eriosoma patchiae, Eriosoma pyricola, Eriosoma ulmi, Kaltenbachiella pallida, Macrosiphum euphorbiae, Mimeuria ulmiphila, Tetraneura ulmi, Tinocallis platani and Tinocallis nevskyi. Of the 22 species that feed on wych elm (Ulmus glabra) worldwide, Baker (2015) lists 15 as occurring in Britain: Aphis fabae, Toxoptera aurantii, Aulacorthum solani, Colopha compressa, Eriosoma flavum, Eriosoma grossulariae, Eriosoma lanuginosum, Eriosoma patchiae, Eriosoma ulmi, Kaltenbachiella pallida, Tetraneura ulmi, Tinocallis platani, Tinocallis nevskyi and Tinocallis takachihoensis.